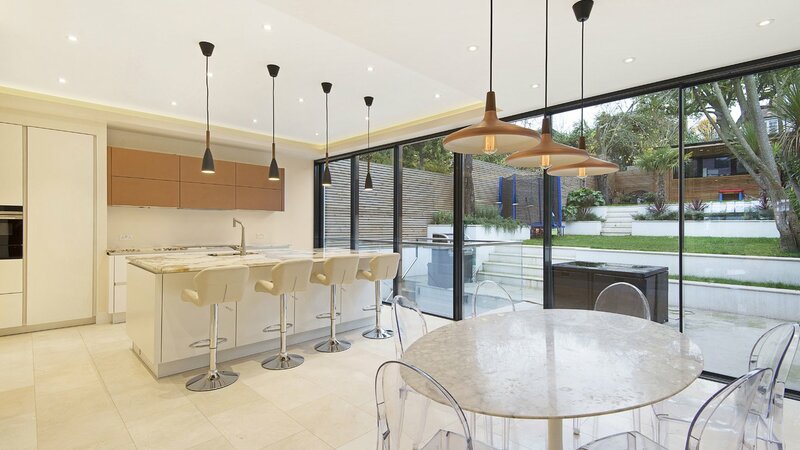 A stunning six bedroom house situated on Dora Road – Wimbledon, comprehensively refurbished throughout, offering an exceptional contemporary open plan living style with a high quality finish and bespoke furniture. This fully-furnished property is arranged over four floors with ample living and entertaining space. On the ground floor of this property there is a large open plan kitchen and dining area with fully integrated appliances and sliding doors out on to the neatly kept patio and garden. A double reception room with integrated plasma screen and bespoke furniture, a utility room and downstairs WC. The lower ground floor offers a spacious Games and TV Room, inclusive of pool table and projector screens, second patio area and access out on to the garden. There are six generously sized bedrooms, two en-suites and two further bathrooms, which are all tastefully designed. A separate dressing room can also be found on the first floor. This property also has a driveway for parking. This property is flexible with furniture. This immaculate house is located just moments from Wimbledon Park and within easy reach of the many amenities on offer from Wimbledon town and the restaurants and boutiques of Wimbledon Village. The closest transport links include: Wimbledon Park (District Line) and Wimbledon mainline (National Rail, District line and Tram link) allowing for easy access in about out of London.